Exped Chair Kit is your sofa in the wild. 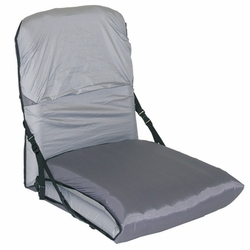 Protective cover converts your Exped mat into a chair or comfort lounger. Once your mat is in the Chair Kit you can switch from chair to sleeping mat without standing up. Poles and straps can be removed to save weight when only used as a protective cover for your mat. Couple multiple mats using the side buckles. Three different openings in the pole sleeve can be used to insert different kinds of stiffeners like tent or trekking pole segments. Premium materials: Floor is made of Exped�s PU coated tentfloor fabric with 10�000 mm water column. Top is of Exped�s skin friendly sleeping bag lining fabric. The stiffeners used are DAC SL 9 mm tentpole segments. Insert an EVA mat like the Double Mat Evazote (not included) for added protection on very rough ground.